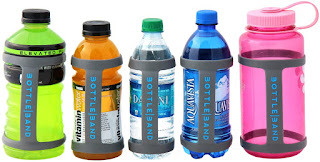 What do you think of this BottleBand? Turn any bottle into a handheld! Stretches to fit any sized bottle - from a Nalgene to a 16 oz generic bottle. Fits any hand size. Finished your water? You can throw your disposable bottle away, put the band on your wrist, and run unencumbered. But the best part is that it works better and costs less than a $20-30 handheld that can only fit one bottle. BONUS QUESTION! Who has the best price? Usually it's the US Amazon site, sometimes it is the UK site or Canadian site!